"Great for holidays when there are picky eaters in the crowd. Can make as many as needed or just one if you like. Got this from an internet friend. Good served with fruit and coffee cake." Crack the eggs into a large resealable freezer bag. Press out most of the air, and seal. Shake or squeeze to beat the eggs. Open the bag, and add the ham, cheese, onion, green pepper, tomato, salsa, and mushrooms. Squeeze out as much of the air as you can, and seal the bag. 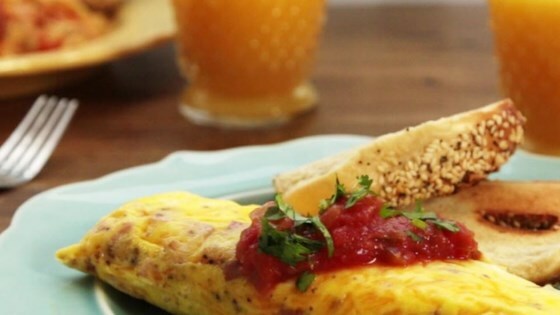 Quick and easy breakfast with virtually no clean up. I just finished doing 2 of these omelets. Both of the bags broke in the boiling water. I used good quality zip lock bags and ended up with a watery mess!! Quick tip for those concerned about melting the bags- drop a plastic colander in your pot for easy, no splash drop ins and removal. This is a great recipe! My only suggestion is to use the Steamer Baggies! They are made for the heat!